LONDON (AFP) - The British government approved a new third runway at London's Heathrow airport on Tuesday (Oct 25), a long-awaited decision that has stoked divisions and follows decades of debate. The move was hailed by Transport Secretary Chris Grayling as a "momentous step" but sparked protests and threats of legal action from opponents. Following Britain's vote in June to leave the European Union, the "long overdue" decision would "send a clear message today that Britain is open for business", Mr Grayling told Parliament. The government said the new runway would "bring economic benefits to passengers and the wider economy worth up to £61 billion" ($103.14 billion) thanks to the increase in the amount of air traffic the capital is able to handle. It said up to 77,000 local jobs are expected to be created over the next 14 years, while the airport has committed to create 5,000 apprenticeships over the same period. 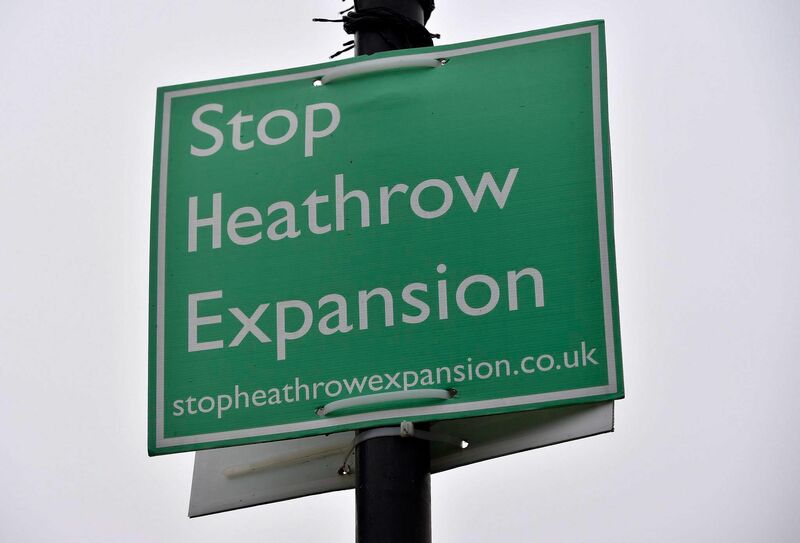 But there is strong environmental opposition to the expansion - the capital's first new full-length runway since World War II - and the approval process could still delay or even block its execution over the coming years. Ministers opposed to the plans have been granted the rare opportunity to voice their dissenting views, including Foreign Secretary Boris Johnson, an outspoken critic of Heathrow expansion. The former London mayor said he would continue to fight the plans, warning the capital risked becoming the "city of planes". "Building a third runway slap bang in the middle of the western suburb to the greatest city on earth is not the right thing to do," he said. The government rejected a rival bid for a second runway at Gatwick airport south of the capital, backed by current London Mayor Sadiq Khan. "This is the wrong decision for London and the whole of Britain," Mr Khan said, adding that he would look into the possibility of legal action. "A new runway at Heathrow will be devastating for air quality across London - air pollution around the airport is already above legal levels of NO2 (nitrogen dioxide)." The decision marks the beginning of a lengthy process before the project can begin in earnest, including a year until it can receive full parliamentary approval. Business leaders, many of whom have long campaigned for a third runway, say London's five existing airports are not keeping up with rising air travel demand. Mr Paul Drechsler, president of the Confederation of British Industry, said the outcome was an "enormous relief" to firms across Britain. "A new runway at Heathrow is really fantastic news, especially as the country has waited nearly 50 years for this decision," he said. Budget airline easyJet said it would swell its operations following the expansion, which it said would benefit the economy and passengers. But environmentalists are fiercely opposed to any airport expansion in London, parts of which already routinely breach EU air pollution limits. Campaign group Greenpeace said it was ready to take the government to court, in conjunction with local authorities opposed to the plans. Activists held a protest on Tuesday in anticipation of the announcement, blocking a fake runway set up outside Parliament. "People are going to be ready to fight this decision," said protester Annie Wright. The plans also face opposition from west London lawmakers and residents, including Conservative MP Zac Goldsmith ,who resigned following the announcement. He described the government's decision as the "most polluting, most disruptive, most expensive option". "The sheer complexity, cost and legal difficulties mean it is unlikely ever to happen," said Mr Goldsmith, whose resignation will trigger a by-election in his Richmond constituency. The Conservative Party said it will not fight the by-election, in which Mr Goldsmith plans to stand as an independent candidate. Hundreds of homes would have to be demolished to accommodate the runway and the small village of Harmondsworth, on the edge of the airport, would be largely flattened. On the village green in front of two local pubs, banners were put up against the expansion. Mr Paul Cooper, a taxi driver from the village, told Agence France-Presse: "I feel sorry for the older generation. They don't want to be moving at their time of life. They should be looked after." "They should give us compensation but I don't know if they will or they won't. It's a lovely village. It's a shame it's being knocked down."